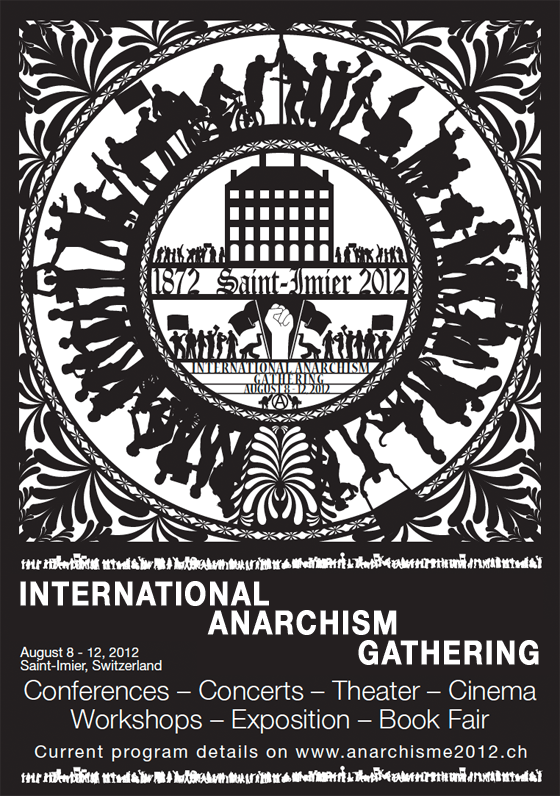 Tomorrow, Wednesday 8th August, marks the beginning of the International Anarchist Gathering in St-Imier, Switzerland. Comrades from across the world will be travelling to St-Imier for the occasion; there will be conferences, talks, exhibitions & workshops on everything from Anarchist organisation, theory and history, to culture, anti-authoritarian strategy, and contemporary social movements, all against the backdrop of the Jura Mountains. This gathering also celebrates the 140th anniversary of the founding of the St-Imier Anarchist congress following the anti-authoritarian split with Marx’s First International. All libertarians from the various anarchist movements around the world, and all those interested in learning more about anarchism, are invited to gather from August 8-12, 2012 in St-Imier in the Jura mountains in Switzerland. We will be celebrating the 140th anniversary of the first congress of St-Imier that was held in 1872, when the St-Imier Anarchist International was created after anti-authoritarian members were expelled from Marx’s First International. Since then, the world has changed in some ways with the different libertarian currents evolving in various directions, an aspect that will be well represented at the gathering in St-Imier. Certainly, time has not diminished the ways in which the weakest in society are being oppressed by the most powerful, and the meeting will accordingly address the multitude of approaches to resist these forms of oppression. The Jura Federation and the Congress of St-Imier 1872 In 1864, the International Workers Association was founded, quickly followed by sections in La Chaux-de-Fonds, Le Locle, St-Imier and other regions in the Swiss Jura mountains. Many of the members in these sections were working in their homes as watchmakers, were well read, and had an independent spirit. When Bakunin came to the region in 1869, there was a meeting of minds that was not without consequences. As a result of this convergence of ideas, the Jura Federation became the libertarian pole of the First International, opposed to the Marxists. Infuriated by this opposition, Marx did everything he could to eliminate this diverging current. In 1872 he thought that he had achieved that goal. At the Hague Congress he managed to assemble his supporters and with some of his supporters posing as representatives of non-existing sections, managed to get votes passed for the exclusion of Bakunin and James Guillaume, only missing a few votes to do the same to Adhemar Schwitzguebel, which were all delegates from the Jura Federation. Shocked by these actions, the sections that were sympathetic to the anti-authoritarian current, including Spain, Italy, France, Belgium and the USA, organized a conference in St-Imier, where they passed resolutions that were strongly libertarian. The anti-authoritarian IWA survived the Marxist branch to the end of the century. 140 years after the Congress of St-Imier, the exploitation and alienation of workers is still just as brutal. The Marxist illusion has dissipated in light of the communist dictatorships. Capitalism lives from crisis to crisis. Social crises, political crises, in addition to the current ecological crisis. Where does the anarchist movement stand today? The anarchist gathering in St-Imier in 2012 will be an opportunity to review the history of the anarchist movement, its ideas, its achievements, its hopes, its defeats, and what remains today; its own battles and those it shares with others: anti-militarism, anti-racism, anti-sexism, autonomous self-management, degrowth, education, feminism, internationalism, non-violence, etc..
Also, you can hear one of our comrades in Afed talk about the history of the congress, linking this to what will be happening in Switzerland this week, online here, at the Circled A Radio Show, http://thecircleda.com/2012/04/19/show-45-17-04-12-nick-heath/, from earlier this year. This entry was posted in Uncategorized/Reblogged. Bookmark the permalink.